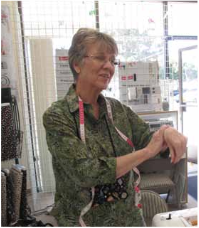 Lynne will explain how to select and read a pattern, purchase the proper fabric for your project, and how to prepare it before sewing. In class you lay out your fabric and cut out the pattern. Then you will sew your project learning and using different stitches on your sewing machine. Each student will receive individualized help from Lynne. Basic Sewing techniques will be demonstrated and shared with the whole class. If you do not own a machine, we have machines for you to use in class and we can help you choose which machine is best for you to purchase. The series is 4 weeks and the cost is $90. Glass-head pins (metal approx. 1 1/4”) with pincushion or magnetic holder. Seam guide and other small rulers for measuring fabric and pattern pieces. Needles - appropriate for fabric chosen for sewing project. Thread - appropriate for fabric chosen for sewing project. “Blow-Off ” for cleaning sewing machine. If bringing your own sewing machine please be sure to bring your manual and all parts. Wash and dry your fabric as you would a finished item - 2x - 3x flannel. Check back of pattern for fabric choices and notions needed. Make sure if you’ve chosen a knit fabric the pattern is appropriate or if you’ve chosen a non-stretch fabric the pattern is also appropriate.